Rapid rise in the number of car owners. As our economy keeps getting better, more people are becoming car owners and they will need to get their vehicles washed. Most car owners do not have the leisure of taking care of their vehicles themselves. The capital required to start this business depends on the scale and approach you intend to apply. Therefore, you can kick off this business with very little money. Nigeria is a car loving nation. Acquiring and maintaining a car is one of the first dreams of everyone. Whether as a necessity or just to show off. Take a casual look around you, there are cars everywhere; in homes, churches, malls, designated parking lots, traffic jams, everywhere! Every vehicle you see needs body or engine wash. Therefore is owned by a potential client. This business is open to everyone; the uneducated, secondary school leaver, undergraduate, employed, unemployed, to all and sundry! Determine The Type Of Car Wash Services You Can Afford. A Full-Service Car Wash. This involves internal vacuuming, engine wash and external cleaning performed by a staff or workers. The Automatic Rollover Wash. This is where the vehicle owner stays in the auto while it is pulled through a conveyor-type system. A Self-Service Wash. 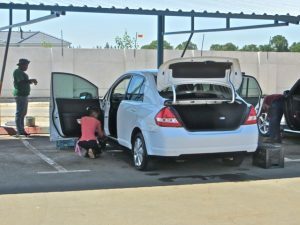 Here, the car owners wash their own cars in a bay with the use of a wand. A mobile car wash. This is where the business owner travels in a specially equipped vehicle to the auto’s location and does the washing there. The type of services your car wash business chooses to offer generally depends on the capital you can invest, the location of the business and the spending power of your targeted market. If you don’t enough capital to set up a full scale car wash business, don’t worry. The easiest way of raising money is by offering door-to-door services to friends, relatives, neighbors and the elderly. You can also offer a monthly subscription to the few clients you already have and save some part of the money to set up your business. For example, you can reach an agreement with 50 home owners in an estate to wash their cars three times a week in their homes for a monthly fee of N5,000.00 each. At the end of the month you will have made N250,000.00. You can go to homes, offices, restaurants, shopping malls or even gym centers to wash prospective client’s cars while they are busy with their errands and all. These approaches don’t only put money in your pocket but also help you advertise your services, thereby increasing your customer base prior to setting up your own bay. Before setting up a garage for your car wash business, it is essential to have the all basic tools for car washing. These include hand brushes, sponges, buckets, washing rags, car cleaning solutions, etc. you can start out your door to door services with these tools. Other equipment such as water pumping machine, hose and nozzle, pressure washer, stand by generator, water storage tanks, vacuum cleaner, sprayers, would be required when you operate on a full scale. Concretized floor and an arena for customers to relax while waiting for the services will go a long way to attract and keep customers. Location is indeed very crucial to the success of this business. Setting up your garage by a very busy street with high traffic flow will positively impact the business. Other viable sites are near automobile workshops, cinemas, relaxation gardens, car stands and shopping malls. However, it is imperative that you obtain the necessary license to operate your business in any desired location. To avoid stories that touch the heart. This is the main element in the business, it is therefore very important that the location is close to a natural water supply. Other alternatives include drilling a bore-hole, or digging a well, which should be treated regularly. Your PVC tank should always be filled with water, should in case, there is water shortage, then tank water could be used. Look for people with a bit of job experience, and start all employees commission basis. They will be paid based on the number of cars they wash each day. Do not worry about training programs for new hires in the beginning; in-person training can be more than enough to learn the skills required. Consider your customer demographic and the best way to reach them, whether it’s flyers, billboards, leaflets or print ads in a local newspaper. You’ll also need to invest in good signage. Thanks for this explanation. Greater heights together.